Blackjack with Perfect Pairs, Bet Behind and 21+3 side bets, dedicated tables with stakes starting as low as £2.50 makes William Hills Live Blackjack a serious contender for the best out there! 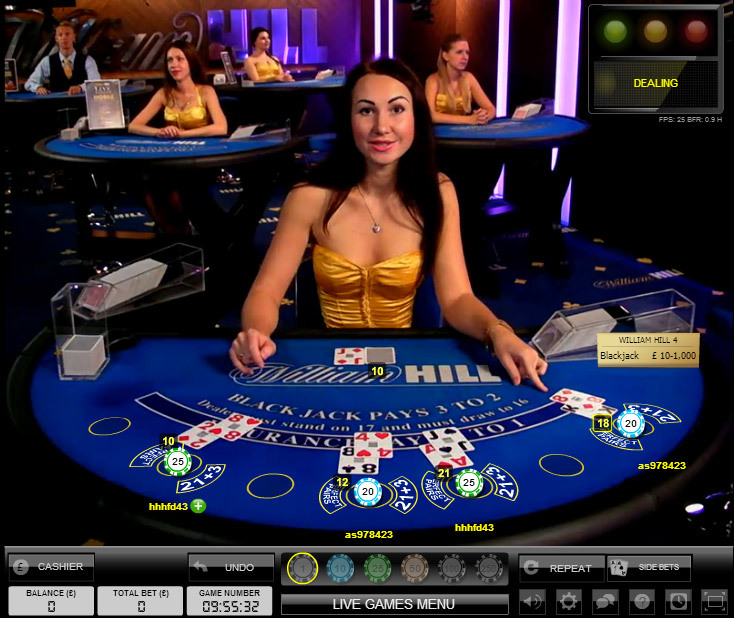 William Hill offers Live Blackjack players two live casinos to play at. There is a Playtech live casino that’s available in a non download format where you can play Unlimited and 7 Seat Blackjack. The Evolution Live Casino offers a more comprehensive set of blackjack tables, with a range of dedicated William Hill live blackjack tables and the normal generic tables shared with other live casinos. 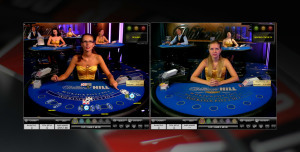 Of the two, the Evolution live casino is the better one as it has a greater variety of tables and betting options. Rather annoyingly William Hill don’t give their live casinos names, so I’ll do my best to help you recognise which is which and how you can get them or click Playtech to go to the Playtech Casino or Evolution to go to the Evolution Casino. The basic game details / rules are normally what attracts me to a live casino, so getting down to the nitty gritty here are the details. Multi-Seat Yes – up to three No, but Multi Table is. 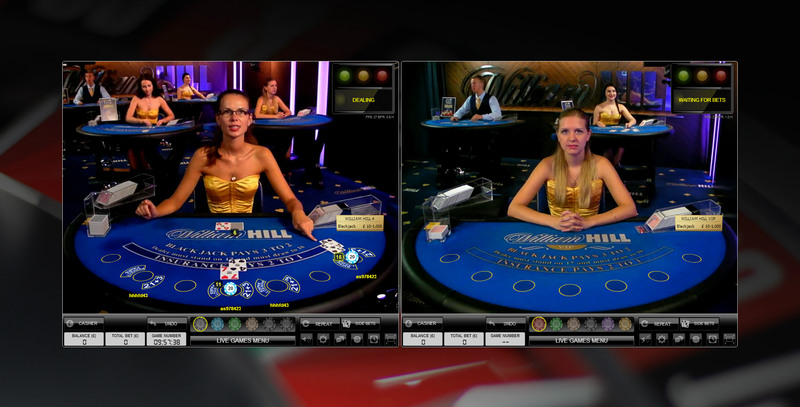 You’ll find the Playtech casino if you select the Casino tab and then on the right hand side select Live Casino. 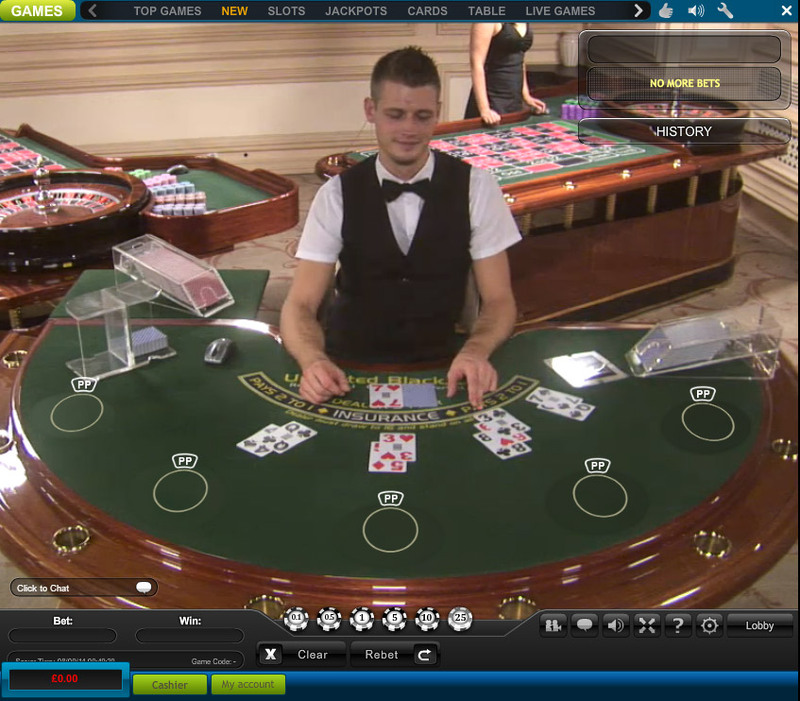 You’ll be taken to the live casino landing page where you can choose Live Blackjack or one of the other live games. Unlimited Blackjack – where any number of people play the same hand as if it is their own. Normal rules apply with the exception of splits. Standard strategy is followed for splits, but you’ll be offered the choice of playing the hand or folding it. If you choose to fold then your stake is returned to you minus 20%.! 7 Seat Blackjack – this is a standard 8 deck game for up to 7 players. You can Bet Behind and also play multiple seats if you’re lucky to get a seat. All the tables are shared with other casinos so at busy times you may struggle to get a seat. There is the option to join a waiting list for the tables and you’ll be notified when a seat becomes available. If you’ve experienced the Playtech software before, maybe at Bet365 Live Casino? then you’ll be aware they have two dealing studios, a European and an Asian one. William Hill have only taken the feed from the European studio, so if you like the Playtech software and want to experience playing with Asian dealers head over to Bet365. Stake levels are on the low side. This is good news if you’re a low roller as minimum stakes start at £2.50 which is quite unusual these days! The Evolution casino is altogether a different proposition. 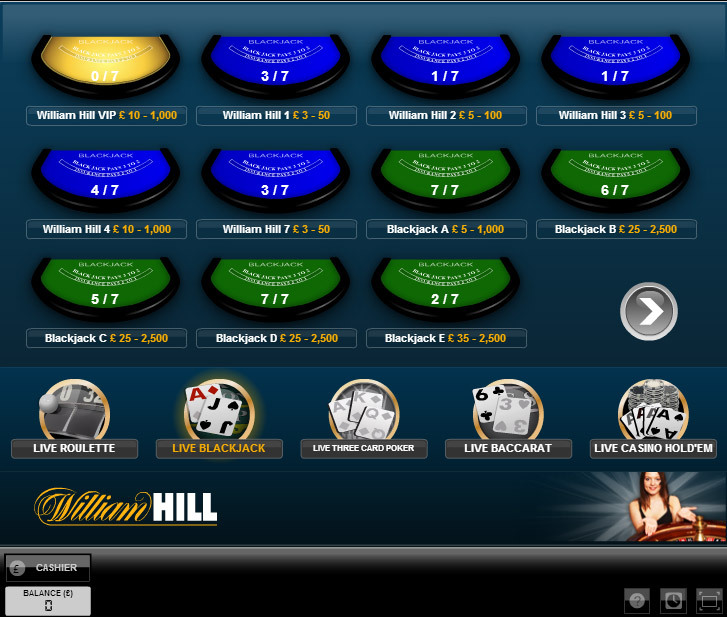 It gets it’s own tab on the home page of William Hill and from there your taken to a comprehensive landing page that displays all the live casino games. Blackjack side bets are available on all tables. You get bet Bet behind, Perfect Pair, 21+3 Poker and Insurance. There is also the ability to play at multiple tables. Once you’ve selected the tables they are displayed in a nice interface which automatocally arranges them depending on the number of tables / games you’ve added. William Hill have one of the most comprehensive live blackjack solutions. The playing interface is easily adjusted through a series of well layout out settings on the playing screen. I prefer to play in classic screen mode and have the sounds down low and if I’m not playing side bets then I have that turned off as it makes the table to busy for my liking. The great thing about the dedicated tables are the in play promotions that William Hill run, which is one of the reasons why I come back and play here. You can also play the Evolution live casino on your mobile, but at present Blackjack isn’t available. As you’d expect from a long established book maker, William Hill accept all sorts of payment methods. A full list is supplied above but some may not be available depending on your country of origin. Customer Service is available 24 x 7 and the most common tool is Live Chat. You just click on the link and away you go. I’ve only had to use them once and that was to find a bit more about the bonuses being offered. The rep knew their stuff and I went away happy that my question had been answered. William Hill hold a gaming licence issued by the Gibraltar Gaming Commission as well as a number of other licenses covering the other aspects of their gaming operations. I’ve known William Hill all my life with their betting shops being a face on our high streets. This provides me with an additional level of reassurance which makes it difficult for the non land based operations to compete with. See the William Hill Website for details of the latest bonuses. If your after Blackjack with side bets, low initial stakes and no trouble in getting a seat then head for the Evolution Live Casino and the dedicated tables. It has the lot. Quite honestly I don’t know why you’d play at the Playtech casino unless your interested in doubling on splits and being able to split a split! I like the playing interface a lot and the dealers in their gold dresses certainly look the part. Give it a try to see what I mean and even play a few hands and claim the risk free £20 so your not out of pocket of you lose!. I have tried to be objective and consistent with all my live Blackjack casino reviews. Hopefully they will strike a chord with you, but I thought it might be helpful to explain the criteria I used to mark each of the casinos. Hopefully, the categories and explanations make logical sense. Game Options – Here I am interested in the house rules or game features. These are things like what you can do with splitting pairs, what cards you are allowed to double on, whether the dealer has to hit on soft 17’s. These are important for two reasons, firstly playability and second because restrictive practices here increase the house edge if you are playing standard blackjack strategy. If you are interested then check out my Blackjack Strategies page for a more detailed list of the variations. Customer Support – Do they have multiple methods for communication with me? Is support available 24×7? Do they have instant chat?, are they quick to respond?. Are they able to help me immediately?. Do they have an online FAQ and self help library? Are the support people knowledgeable about the product i’m playing?. Playing Experience – What is the overall impression of the casino. Did I have a good time?, are the dealers nice and chatty?, is everything easy to understand?. Does it have a good set of games, is there a comprehensive set of betting options? Are high stakes players taken care of? Software – What’ is the software like to use, does it integrate well with the rest of the casino?. Are the images clear and the video streaming fast.? Have they taken more than the default shared tables? Is it available on mobile? If you would like to retrieve all of the reviews for a particular category, for example, you want to see all the casinos that have Evolution Gaming as the main live casino software. Select the Software tab and then Evolution. 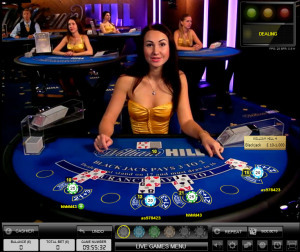 You will then get all the casinos that have Evolution software displayed on the left hand side.